Alfred Bernhard Nobel ( /noʊˈbɛl/ ; Swedish: [ˈalfrɛd nʊˈbɛlː] ( listen ); 21 October 1833 – 10 December 1896) was a Swedish businessman, chemist, engineer, inventor, and philanthropist. Nobelium is a synthetic chemical element with symbol No and atomic number 102. It is named in honor of Alfred Nobel, the inventor of dynamite and benefactor of science. A radioactive metal, it is the tenth transuranic element and is the penultimate member of the actinide series. Like all elements with atomic number over 100, nobelium can only be produced in particle accelerators by bombarding lighter elements with charged particles. A total of twelve nobelium isotopes are known to exist; the most stable is 259No with a half-life of 58 minutes, but the shorter-lived 255No is most commonly used in chemistry because it can be produced on a larger scale. Dynamite is an explosive made of nitroglycerin, sorbents and stabilizers. It was invented by the Swedish chemist and engineer Alfred Nobel in Geesthacht, and patented in 1867. It rapidly gained wide-scale use as a more powerful alternative to black powder. Bofors AB is a Swedish arms manufacturer. The name has been associated with the iron industry and artillery manufacturing for more than 350 years. After reading a premature obituary which condemned him for profiting from the sales of arms, he bequeathed his fortune to institute the Nobel Prizes. His name also survives in modern-day companies such as Dynamit Nobel and AkzoNobel, which are descendants of mergers with companies Nobel himself established. Dynamit Nobel AG is a German chemical and weapons company whose headquarters is in Troisdorf, Germany. It was founded in 1865 by Alfred Nobel. Akzo Nobel N.V., trading as AkzoNobel, is a Dutch multinational company which creates paints and performance coatings for both industry and consumers worldwide. Headquartered in Amsterdam, the company has activities in more than 80 countries, and employs approximately 46,000 people. Sales in 2016 were EUR 14.2 billion. Following the acquisition of ICI, the company restructured on 2 January 2008, and rebranded itself on 25 April of the same year. Immanuel Nobel the Younger was a Swedish engineer, architect, inventor and industrialist. He was the inventor of the rotary lathe used in plywood manufacturing. He was a member of the Nobel family and the father of Robert Nobel, Ludvig Nobel and Alfred Nobel. He also often experimented with nitroglycerin with his sons, which led to his son Emil Oskar Nobel's death because of an explosion at his father's factory Heleneborg in Stockholm in 1864. Olaus Rudbeck was a Swedish scientist and writer, professor of medicine at Uppsala University and for several periods rector magnificus of the same university. He was born in Västerås, the son of Bishop Johannes Rudbeckius, who was personal chaplain to King Gustavus Adolphus, and the father of botanist Olof Rudbeck the Younger. Rudbeck is primarily known for his contributions in two fields: human anatomy and linguistics, but he was also accomplished in many other fields including music and botany. He established the first botanical garden in Sweden at Uppsala, called Rudbeck's Garden, but which was renamed a hundred years later for his son's student, the botanist Carl Linnaeus. Nobel found that when nitroglycerin was incorporated in an absorbent inert substance like kieselguhr (diatomaceous earth) it became safer and more convenient to handle, and this mixture he patented in 1867 as "dynamite". Nobel demonstrated his explosive for the first time that year, at a quarry in Redhill, Surrey, England. In order to help reestablish his name and improve the image of his business from the earlier controversies associated with the dangerous explosives, Nobel had also considered naming the highly powerful substance "Nobel's Safety Powder", but settled with Dynamite instead, referring to the Greek word for "power" (δύναμις). Nobel later combined nitroglycerin with various nitrocellulose compounds, similar to collodion, but settled on a more efficient recipe combining another nitrate explosive, and obtained a transparent, jelly-like substance, which was a more powerful explosive than dynamite. 'Gelignite', or blasting gelatin, as it was named, was patented in 1876; and was followed by a host of similar combinations, modified by the addition of potassium nitrate and various other substances. 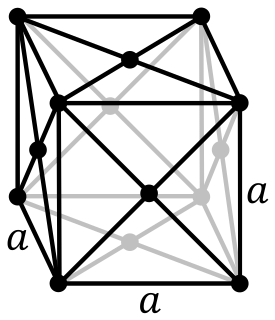 Gelignite was more stable, transportable and conveniently formed to fit into bored holes, like those used in drilling and mining, than the previously used compounds and was adopted as the standard technology for mining in the Age of Engineering bringing Nobel a great amount of financial success, though at a significant cost to his health. An offshoot of this research resulted in Nobel's invention of ballistite, the precursor of many modern smokeless powder explosives and still used as a rocket propellant. Accused of “high treason against France” for selling Ballistite to Italy, Nobel moved from Paris to Sanremo, Italy in 1891. 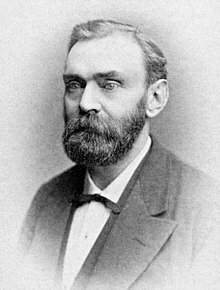 On December 10, 1896, Alfred Nobel succumbed to a lingering heart ailment, suffered a stroke, and died. Unbeknownst to his family, friends or colleagues, he had left most of his wealth in trust, in order to fund the awards that would become known as the Nobel Prizes. He is buried in Norra begravningsplatsen in Stockholm. Nitroglycerin (NG), also known as nitroglycerine, trinitroglycerin (TNG), nitro, glyceryl trinitrate (GTN), or 1,2,3-trinitroxypropane, is a dense, colorless, oily, explosive liquid most commonly produced by nitrating glycerol with white fuming nitric acid under conditions appropriate to the formation of the nitric acid ester. Chemically, the substance is an organic nitrate compound rather than a nitro compound, yet the traditional name is often retained. Invented in 1847, nitroglycerin has been used as an active ingredient in the manufacture of explosives, mostly dynamite, and as such it is employed in the construction, demolition, and mining industries. Since the 1880s, it has been used by the military as an active ingredient, and a gelatinizer for nitrocellulose, in some solid propellants, such as cordite and ballistite. Gelignite, also known as blasting gelatin or simply jelly, is an explosive material consisting of collodion-cotton dissolved in either nitroglycerine or nitroglycol and mixed with wood pulp and saltpetre. Ascanio Sobrero was an Italian chemist, born in Casale Monferrato. He was studying under Théophile-Jules Pelouze at the University of Turin, who had worked with the explosive material guncotton. Ballistite is a smokeless propellant made from two high explosives, nitrocellulose and nitroglycerine. It was developed and patented by Alfred Nobel in the late 19th century. Ludvig Immanuel Nobel was a Swedish-Russian engineer, a noted businessman and a humanitarian. One of the most prominent members of the Nobel family, he was the son of Immanuel Nobel and the older brother of Alfred Nobel. With his brother Robert, he operated Branobel, an oil company in Baku, Azerbaijan which at one point produced 50% of the world's oil. He is credited with creating the Russian oil industry. Ludvig Nobel built the largest fortune of any of the Nobel brothers and was one of the world's richest men. Following the Bolshevik revolution, the communists confiscated the Nobel family's vast fortune in Russia. The Nobel family is a prominent Swedish and Russian family closely related to the history both of Sweden and of Russia in the 19th and 20th centuries. Its legacy includes its outstanding contributions to philanthropy and to the development of the armament industry and of the oil industry. Some of its foremost members are Immanuel Nobel, the younger, engineer developer of underwater naval mines and inventor of the rotary lathe used to produce plywood, Ludvig Nobel, the founder of Branobel and one of the richest and most important men in Russia at his time, and Alfred Nobel, the inventor of dynamite who left the major part of his estate to the creation of the Nobel Prizes. Gyttorp is a locality situated in Nora Municipality, Örebro County, Sweden with 661 inhabitants in 2010. Today it is mainly known for its explosive factory and Ralph Erskine's typical town houses. It is situated by lake Vikern. Ragnar Sohlman was a Swedish chemical engineer, manager, civil servant, and creator of the Nobel Foundation. Michael Nobel is a Swedish entrepreneur of Russian origin. He is a member of the Nobel family, a descendant of Ludvig Nobel, a former head of the Nobel Family Society (1995–2006), a co-founder and former Chairman of the Nobel Charitable Trust. At present, Nobel serves on several international boards that focus on scientific, medical and charitable initiatives. He promotes energy efficiency and alternative energy technology. Vinterviken ("Winter-cove") is a bay in the Mälaren lake in southern Stockholm, Sweden. Vinterviken is located in a valley surrounded by the Gröndal and Aspudden suburb areas. The origin of the name Vinterviken can be traced back to the 17th century. Back then a common winter route used to go from Fittja and the Mälaren islands, and entered the city through Vinterviken and lake Trehörningen. ↑ "Nobelium". Royal Society of Chemistry. Retrieved 26 February 2016. ↑ "Alfred Nobel's Fortune". 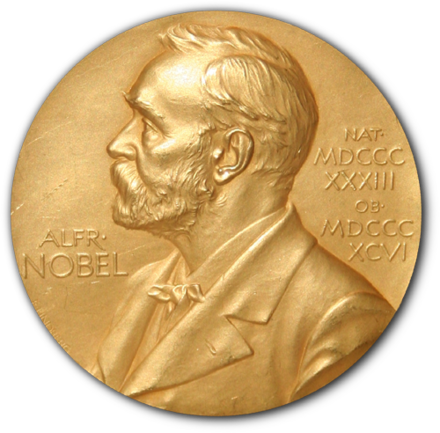 The Norwegian Nobel Committee. Retrieved 26 February 2016. ↑ "Alfred Nobel's Will". The Norwegian Nobel Committee. Retrieved 26 February 2016. 1 2 3 4 5 6 7 8 9 10 11 12 13 14 15 "Alfred Nobel". Britannica.com. 19 March 2012. Retrieved 26 January 2014. 1 2 3 4 5 6 7 8 Encyclopedia of Modern Europe: Europe 1789–1914: Encyclopedia of the Age of Industry and Empire, "Alfred Nobel", 2006 Thomson Gale. ↑ "The Man Who Made It Happen — Alfred Nobel". 3833. Archived from the original on 30 May 2014. Retrieved 3 May 2012. ↑ "Alfred B Nobel - Svenskt Biografiskt Lexikon". sok.riksarkivet.se. ↑ "Patents – Alfred Nobel". nobelprize.org. Retrieved 13 October 2015. ↑ "Alfred Nobel (1833–1896)". BBC. Retrieved 6 December 2015. ↑ Schultz, Colin. "Blame Sloppy Journalism for the Nobel Prizes". Smithsonian. 1 2 3 4 One or more of the preceding sentences incorporates text from a publication now in the public domain : Chisholm, Hugh, ed. (1911). "Nobel, Alfred Bernhard" . Encyclopædia Britannica . 19 (11th ed.). Cambridge University Press. ↑ Golden, Frederic (16 October 2000). "The Worst And The Brightest". Time. ↑ Braswell, Sean. "The Newspaper Error That Sparked the Nobel Prize". OZY. 1 2 Lobell, Håkan (2010). Historical Monetary and Financial Statistics for Sweden Exchange rates, prices, and wages, 1277–2008. S V E R I G E S R I K S B A N K. p. 291. ISBN 978-91-7092-124-7. ↑ (Ntb-Afp). "Alfred Nobels familie tar avstand fra økonomiprisen". Aftenposten.no. Retrieved 26 January 2014. ↑ Nobel, Alfred. "Alfred Nobel's House in Paris". Nobel Media AB. Nobel Media AB. 1 2 Nobel, Alfred. "Alfred Nobel's Final Years in Sanremo". Nobel Media AB. ↑ "Alfred Nobel – St. Petersburg, 1842-1863". NobelPrize.org. ↑ Michael Evlanoff; Marjorie Fluor (1969). Alfred Nobel, the loneliest millionaire. W. Ritchie Press. p. 88. "He declared himself an agnostic in his youth, an atheist later, but at the same time, bestowed generous sums to the church..."
↑ Cobb, Cathy, and Harold Goldwhite. Creations of Fire: Chemistry's Lively History from Alchemy to the Atomic Age. New York: Plenum, 1995. Print. 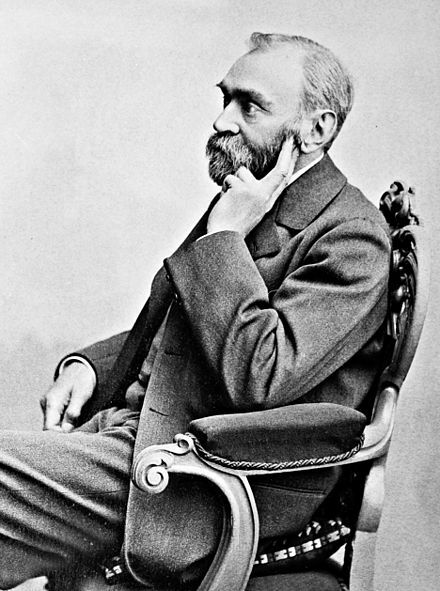 "But Nobel, both atheist and a socialist..."
↑ "Alfred Nobel | Biography & Facts". Encyclopedia Britannica. Retrieved 2017-08-24. ↑ "The Nobel Peace Prize 1905". nobelprize.org. Retrieved 20 December 2018. ↑ Alfred Nobel (2008). Némésis: tragédie en quatre actes. Belles lettres. ISBN 978-2-251-44342-3 . Retrieved 19 August 2011. ↑ "Monument to Alfred Nobel". Saint-Petersburg.com. Retrieved 5 July 2014. ↑ Lemmel, Birgitta. "Alfred Nobel – St. Petersburg, 1842–1863". Nobel Media AB. Retrieved 5 July 2014.